What is the difference between Minimalism and Wealth Essentialism? I often come across people that seem quite confused about the wealth building process, what is required and why somebody would do it. When you tell a person that wealth building is based upon principles such as living below your means, eliminating debt, saving money, having emergency funds they jump to conclusions that it is all about inflicting intentional punishment on oneself. Who would go through life with such torture? Who wants to restrict themselves from having fun, buying things, spending money, and enjoying life they ask. The version in their head is that to one has to sacrifice everything and buy nothing to accomplish a goal which leads to a life not worth living. Otherwise, why wouldn’t everybody do it? I think most people miss the entire point of living a life with purpose, intent and with a higher level of enlightenment. There is some significant benefits to being a minimalist as defined by the guys Joshua Fields Millburn & Ryan Nicodemus which are called The Minimalists. Minimalism is a lifestyle where you rid yourself of what doesn’t really matter in an effort to uncover what really does matter. It opens your eyes. Per the minimalist experts, “minimalism” is a lifestyle choice (and tool) to rid yourself of life’s excess in favor of focusing on what’s important – so you can find happiness, fulfillment, and freedom. I’d take it one step further for the intentional wealth builder. The intentional wealth builder is what I would describe as a wealth essentialist. We aren’t talking about essentialism as defined by Plato either. What I mean by essentialism is that you try and get more of what really matters and what drives you. It’s like minimalism squared which leads to a higher power. Wealth essentialism is the next step after minimalism if someone determines that part of their happiness IS actually contingent, enhanced, or aided by some things material in nature (executed with money). Wealth essentialism requires a bit of a minimalist mentality to usually arrive at that destination. It is difficult to accumulate wealth unless you live below your means, control spending, save money, build emergency funds, and act prudently. You can’t build wealth if you are constantly spending money on everything imaginable with an endless consumption of material items and services. The minimalist mentality then serves as a fantastic foundational base to sift through what really matters to you and what doesn’t. Show me a high earning minimalist and I’ll show you a potentially explosive wealth builder. A wealth essentialist likes financial security. They often work hard (usually at something that they are passionate about) and make substantial earnings. It’s not that they need one of everything for the sake of impressing everybody. They don’t pursue money with the intentions of having a Porsche, a mansion, a lake house, a beach condo, a ski chalet, a landscaped backyard with infinity pool, a luxury sedan, an SUV, a boat, a home theater, and season tickets to every entertainment event within 50 miles of their residence. A wealth essentialist works hard to obtain and enjoy very specific things that provide fulfillment in life. That may turn out to be a Porsche, or a sailboat, or a beach condo but not everything. It is the process of accumulating capital to provide the freedom to pursue things with meaning to them that may end up being things beyond “real necessities” in life. A wealth essentialist is basically a practicing minimalist that places a priority on financial security and a few “luxuries” in life that really add value. Once they identify what really matters, then they know that working hard allows them to consume more of that preferred good or service as opposed to being driven to consume less. Minimalism helps people to cut out the unnecessary to so that they regain control of their time. Wealth essentialism is trying to achieve that same control over their time, living in the moment, and pursuing passions it’s just that perhaps their passions require a higher level of financial resources. Traveling the country in a very nice luxury RV. Golfing challenging and breathtaking courses. Scuba diving the world’s best wrecks and reefs. Being a minimalist is a wonderful thing. In many ways, I wish I was one at my core. My life would probably be even simpler and require less work to achieve an acceptable level of fulfillment. The reality is, I like doing a few things that cost money and have dreams of experiencing things that cost a lot of money. They are still my dreams. They are my authentic goals. I work towards them because it makes me happy. I love saltwater fishing. I love scuba diving. I love going to the ocean and being on high quality, safe, dependable and comfortable boats. Boats are not cheap to buy, operate or maintain. Boats cost a lot of money. The acronym for B.O.A.T. stands for “break out another thousand.” And I dream everyday of owning a reasonable place with a few bedrooms for family and friends in the Florida Keys. I love being there. That’s where I feel most connected to the earth. But a decent place in the Florida Keys isn’t $200,000. It’s just not. I accept that reality. And while many will say, “That’s just a waste. That’s not a necessity. That’s a want, not a need.” I feel differently in my core. I agree, it’s a want, not a need. But I still 100% want it and I don’t want to keep trying to convince myself that I don’t want it and that I’d rather go camping in a tent at Lake Lanier which is north of where I currently live in Atlanta, Georgia. I truly want the boat and I want the property in the Keys. I’m also very willing to work hard to allow myself a higher than average probability of eventually obtaining what I want. I’m allowed to change my mind anytime I choose. I can wake up tomorrow and say, “I’m done pursuing this. It’s no longer worth the effort. Let’s go camping in a tent.” But right now that’s not what my heart is telling me to do. The point of all this is that you may have a similar situation where you know in the bottom of your heart that there is something that brings you enormous joy in life and unfortunately that activity also costs money to do. That one would take a lot of work but that doesn’t mean that there aren’t people that get to do that activity as much as they want for themselves. They’ve earned it and achieved their dream. That’s where you may just discover that you really aren’t a minimalist but rather a wealth essentialist. Close cousins but once just requires a bit more dough-ray-me…And I don’t believe that there is anything wrong with that if you are doing things that make yourself happy and are following your own dreams. It’s just not about wealth for the sake of endless and wasteful consumption. 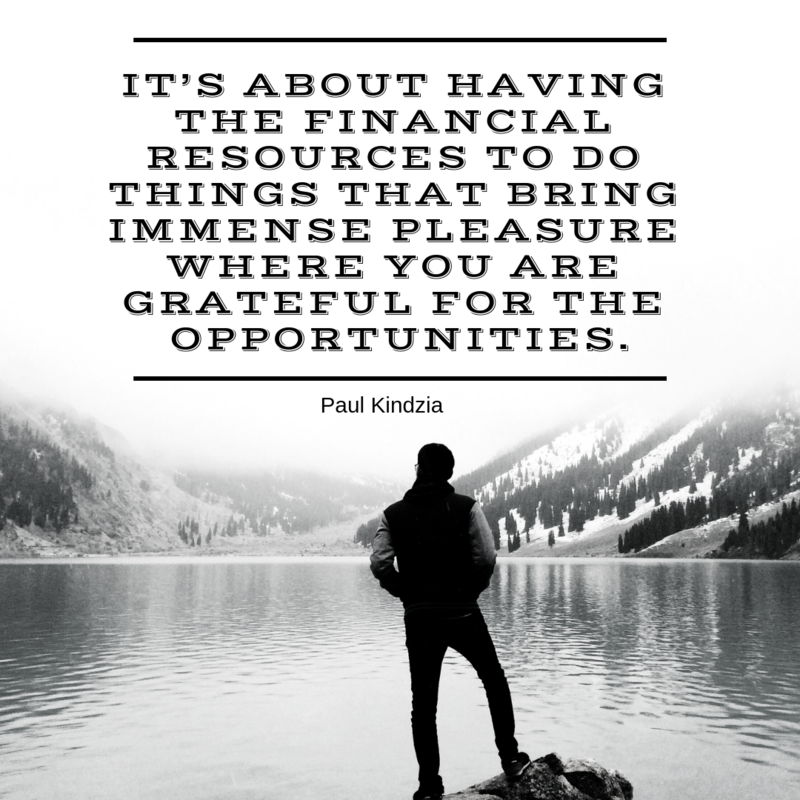 It’s about having the financial resources to do things that bring immense pleasure where you are grateful for the opportunities.